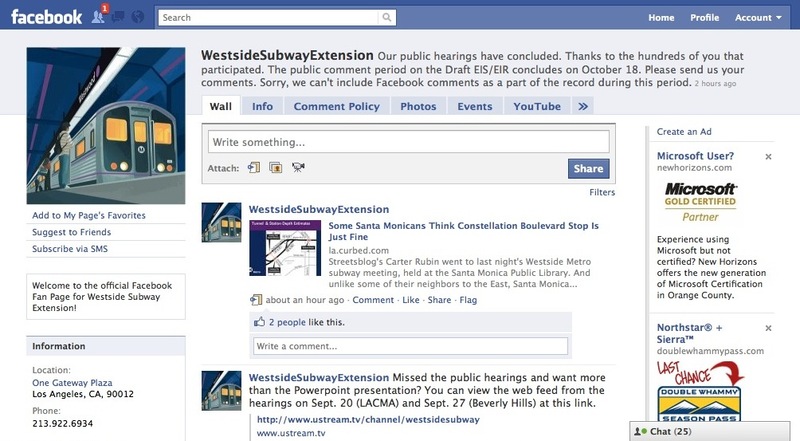 A screen grab of the Westside Subway Extension's Facebook page. With Metro’s Westside Subway Extension Project team just wrapping up a series of five public hearings on the project’s Draft EIS/R, it has a new feather to place in its cap. The project’s public outreach program was this week officially recognized as an example of government innovation from Harvard University. Read the press release here. Metro was one of 173 government programs nationwide selected for the new “Bright Ideas” program designed to recognize and share creative government initiatives around the country. More than 600 applications were received. Harvard recognized the subway project for its use of new communication tools integrated with long-standing outreach strategies, to bring greater numbers of people into the planning process during the Draft EIS/R currently underway and the earlier Alternatives Analysis Study. In the face of a shrinking media market — and less media interest in the subway — the project team was the first at Metro to amplify its outreach with new media strategies such as using blogs, online publications, social networking tools like Facebook (1,700+ fans) and Twitter, and live web streaming of community meetings. The webstream of two of the recent public hearings here. The project’s outreach program will be showcased on the Center’s Government Innovators Network, an online marketplace of ideas and examples of government innovation for policymakers and practitioners. Congratulations to Jody & The Robert Group Team! Well deserved recognition for a tireless effort to reach the community and facilitate public participation. The team should be congratulated not just for the technological innovations, but for the synergy of the planners, the outreach specialists, and the community that has moved the project to the point that it can be implemented on the accelerated schedule envisioned by 30/10… after nearly two decades of idea exchange, it’s now it’s time for the METRO board and the FTA to consider the massive volume and thoughtful content of the public input,make the hard planning decisions, approve the project and funding just in time for Jody to ride the Purple Line train home before she retires. Thanks for the good wishes but I want to be clear that this was very much a team effort. It has involved literally dozens of people. That includes those who “held my hand” early on, the folks I worked with on developing protocols, the staff and consultants who continue to help us track our efforts, the Planning team on the Subway project who trusted, supported and embraced our efforts, my own colleagues in Communications, those that are constantly alerting us to new opportunities, and more. It is a privilege to be part of this great team. And, yes, I do hope to be able to ride the Purple Line home before I retire.